I find resizing photos for web output to be one of the most boring and repetitive tasks in post-processing. My workflow consists of only creating JPEGs as needed, and deleting them when they’ve done their deed. My photo archive also consists of RAW (from the dSLR), TIFF (from film scans), and PSD files, in both AdobeRGB and grayscale color spaces. So with all these requirements, I found that a Photoshop action is the way to go. I process a big batch of photos with Bridge/ACR, and I use a batch process to create all my Flickr files at once. The really cool thing about the action I’ve created is that it doesn’t care what kind of file you have or what color space it’s in. The output is always the same — 800 pixels on the long edge, sRGB, a quality of 12, etc. The action was built to be fairly robust against an array of possible image settings and file types. The main idea behind the action is to be “hands free” so it can blast through a big set of photos with no interaction from the user. The action first flattens any layers that may be present. Then it moves on to scale it down while still in the original color space and bit depth. After downsizing, the action converts to RGB mode just in case you were working in LAB or grayscale. And since the intent is to create images for the web, we then convert to sRGB color space. And so we can save as a JPEG, we then convert to 8 bits. Now it’s time for output, so the action saves the file to a set destination at high quality while maintaining the original file name and metadata. The last step is to close the image without saving so it can move on to the next one if using a batch process. If you don’t have things like layers or other color spaces, the action just keeps going without warning you — it’s no big deal, those steps are just to make it more robust. The action is intended to be customized for each person using it. At a minimum, you’ll want to change the location of the saved file. I put my Flickr exports in a folder on my desktop, but you can put yours wherever you want. To change the location of the saved files, first open up a file to work with. Then go into the action and uncheck the last two lines — “Save” and “Close”. Run the action. Now double-click on the “Save” command to modify it. When you do this, you’ll see a save dialog box. Simply navigate to the folder of your choice and press “Save” — don’t mess with the file name or you’ll end up saving every single image in the future with the same exact name. After you re-record this step, you can check the “Save” and “Close” lines and you should be in business. You can also do the same type of thing with the “Image Size” command if you want something other than 800 pixels. Just make note of which action you’re editing (horizontal or vertical) because you have to type the values into the corresponding box (width or height, respectively). As I just mentioned, there are two actions. This is to take care that vertical and horizontal images maintain a common maximum size. If you run a vertical image through the horizontal action, you’ll get a photo at 800 pixels on the short edge rather than the long edge. And square cropped photos don’t care which one you use. You can run the action on single photos if you’d like — just be aware of the “Close” command at the end of the action. Uncheck it if you don’t want to close the image after exporting. The best way to run this action is with a batch process. 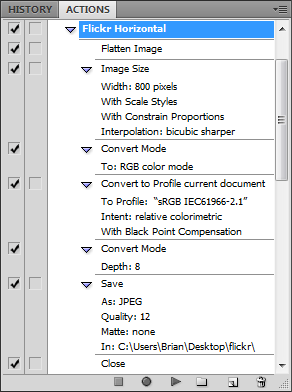 You can do this from Bridge by selecting the photos you want to export and clicking “Tools >> Photoshop >> Batch…” You can also do it straight from Photoshop by clicking “File >> Automate >> Batch…” Either method gets you the same dialog box. Then you pick the action from the drop-down menu. If you run it from Bridge, all you have to do is hit “OK” and it starts running. If you run it from Photoshop, you’ll have to tell it where to get the files from too. I hope some of you will find this useful with your workflow. I know it saves me a ton of time! This article is one of my own project submissions to the Action and Preset Extravaganza. This entry was posted in Features, Flickr, Photoshop Tips, Projects and tagged action, Flickr, photography, photoshop, photoshop action, project, resize, resizer on December 23, 2008 by Brian Auer.